With the date of Imran Khan’s latest political spectacle rapidly approaching, it’s worth examining what the ‘Azadi March’ could really accomplish – something I’m not sure PTI has really thought through very well. After some confusion, Imran Khan has finally settled on midterm elections as his key demand. According to PTI, the last elections were rigged after their calls for electoral reforms went ignored. While there may have been some small scale rigging here and there, it is interesting that PTI claims massive rigging took place since they won second largest number of votes. Is Imran Khan suggesting that his party is also guilty? Or that his opponents were accidentally stuffing ballots for PTI? There’s also the problem that Imran Khan accepted the elections before he rejected them. Last year, the PTI Chairman termed the elections ‘victory for the democratic system‘. Even in April this year Imran Khan said that he accepted the elections. Now he has even taken to slandering the names of those who he recently praised as ‘incorruptible‘. All of this fails to address the key problem with Imran’s demand for midterm elections, though: If the electoral system is flawed, doesn’t it need to be reformed before new elections can take place? If so, doesn’t PTI need to provide detailed electoral reforms first? Think about how Imran’s current plans would work if his ‘Azadi March’ is successful. Millions will descend on Islamabad to demand new elections. Nawaz will lose all confidence and the government will be dissolved. Electoral reforms? By who? A caretaker government? Of who? STEP 1: Hold ‘Azadi March’ to topple PMLN government. 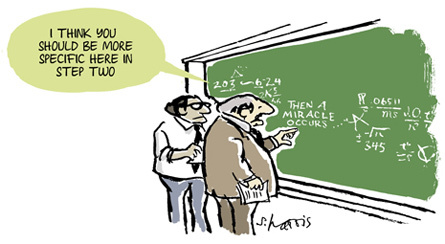 STEP 2: Then a miracle occurs. STEP 3: Corruption and terrorism eliminated. Since being handed the task of actually governing in KP however, one would think that Imran would have learned that something more than praying for miracles is required. Unfortunately, it seems that the PTI chief is sticking with what he knows best, which doesn’t appear to be much. Most likely, nothing will happen. Revolutionary marches have become convenient ways for opposition politicians to keep their workers busy and their photos in the news, but they have yet to get close to accomplishing anything but tying up traffic and distracting the police and security services from stopping actual bad guys. If the Sharifs are smart (to be determined), they will let Imran have his march and go home quietly to plan the next one. The real danger is if Imran actually succeeds this time. There’s no reason to think that he will topple the government, but if he did, then what? It’s one thing to shout slogans, it’s quite another to produce the details required to see those slogans made into actual policy reforms. Imran has proven that he can whip up a crowd in the streets, but he is still relying on miracles for actual governance. This entry was posted in Blogs and tagged Azadi March, imran khan, midterm elections, PTI, reform by Mahmood Adeel. Bookmark the permalink.